Great experience. Great service. No hassle great people. If you’re looking to buy either new or used vehicle then go here and ask for Brett Livengood. He will go out of his way to accommodate you both individually and as a family. He’s not a PUSHY salesman like some but very understanding and professional. Look no further than here and again ask for Brett. Pleasant buying experience. Staff especially Syliva and Billy went out of the way to make sure that I got that vehicle that I wanted. Test drove several while trying to decide - it didn't matter - they wanted me to get what was the right Jeep for my needs. This was the best car buying experience I have ever had! Vic was so kind and down to earth. Marty answered all of our questions. Kristen was also very kind and helpful. I will definitely come back here in the future. Great price! Great car! Travis Jackson was a very warm and welcoming salesman. He was very easy to talk to and did not pressure us into any purchase. The rest of the sales staff were very pleasant to deal with and they went out of their way to help us have the best financing situation possible. 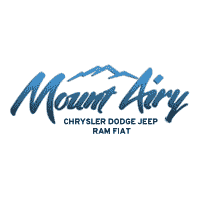 We hope you have seen some of the great things that people are saying about Mount Airy Chrysler Dodge Jeep Ram Fiat but if you still need convincing we invite you to visit the shop. We have awards and trophies from each year we have been in business. Mount Airy CDJRF receives top reviews from customers and our manufacturer each year. Our service department has the very best group of people you could imagine. Most have been with us for over 5 years and all are committed to excellence.